Every day your business likely destroys records. It may be as simple as throwing out old paperwork, deleting old emails, or filming over of surveillance video camera footage. Certainly, clearing space to make way for new things is necessary; not everything can be saved forever. 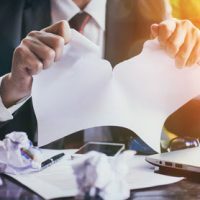 Many business owners aren’t aware that the routine deleting or trashing of information could lead to legal problems in the event that litigation arises. That’s because of the legal doctrine of spoliation, which prohibits any person or party from damaging or destroying information that is potential evidence when it is apparent that litigation may be imminent. In many ways spoliation is common sense. When we file lawsuits or defend against them, the other side often has information that is vital to proving or defending against a lawsuit. We can’t allow businesses that may be threatened with litigation to simply trash evidence, thus preventing anybody from proving anything in court against them. That’s why the duty to preserve evidence arises. That duty arises not just when an actual lawsuit is filed, but when a party reasonably knows that evidence is relevant to potential, future litigation. So, for example, if someone falls on a premises and makes a claim, even if there is no lawsuit filed, that business may be under an obligation to preserve video camera footage, photos, or documents involving the accident. If a business says that products provided to it were defective, the business would need to preserve the products, being reasonably confident that they will be the subject of litigation. The duty to preserve evidence extends to electronic evidence as well, such as emails, texts, or documents stored on computers or in the cloud. However, Florida law does make an exception for evidence that is lost due to routine loss or maintenance of electronic systems. This likely covers “accidental” deletions that may occur by systems that automatically delete information, such as phone messages that delete after certain periods of time, or video recordings that record over themselves periodically. Still, this exception should not be read as a safe harbor. A court likely would find that a business that knows evidence may be relevant to litigation has a duty to avoid or stop automatic deletion. In other words, you could not simply allow a system to automatically delete emails that you know could be evidence, but rather would have to undertake some action to preserve them. If a court finds that you did destroy or allow evidence to be destroyed, the punishment can be severe. A court can order that a jury find against you, or order that the jury assume that whatever was contained in the deleted evidence would have been against your position or defense. This could automatically mean that any factual dispute between you and the other party would be automatically decided against you. Policies and procedures can protect your business from liability and lawsuits. Contact Tampa asset business and tax attorney David Toback to discuss your business documents and review your policies.